On July 26, 2018, about 2007 eastern daylight time, a Piper PA-24-250, N6427P, was destroyed when it impacted the ground during the initial climb after takeoff from Palatka Municipal Airport (28J), Palatka, Florida. The private pilot and passenger were fatally injured. Visual meteorological conditions prevailed, and no flight plan was filed for the local flight. The personal flight was conducted under the provisions of Title 14 Code of Federal Regulations Part 91. A witness was standing in his hangar about 200 yards from the end of runway 17, when he heard an airplane's engine rev-up. He then noticed that the airplane's brakes were engaged while the engine was at full throttle. He believed the pilot was going to perform a soft field or short field takeoff. As the airplane rolled down the runway, the front wheel lifted off the ground then went back down for a few seconds, then the pilot rotated the airplane and it lifted off the ground. He further stated the pilot rotated early as the airplane was slow at that point. He added that the airplane kept climbing "steeper and steeper" and the pilot did not lower the nose to gain airspeed. When the airplane was about 150 ft above ground level, it "stalled, and the left wing drop down and spiraled to the ground." The witness further stated that the engine was running at full power during the entire flight. An airport security video at 28J showed the airplane immediately after takeoff as it climbed to about 150 ft. The video then showed the airplane's left-wing drop and the airplane spiral to the ground. The wreckage was located about 60 ft to the left side of midfield runway 17, which was a 3,510-ft-long runway. The wreckage came to rest on a heading of 270°. The propeller was fractured from the engine and located 2 ft into the ground. The engine was displaced into the instrument panel and cockpit. The landing gear was extended, and the flaps were retracted. Both wings exhibited accordion crushing on the leading edges. Flight control cable continuity was established to all flight controls. The stabilator trim control was fragmented and the trim position could not be verified. Both pitch and trim servos rotated freely, and the clutch was not engaged. The fuselage was crushed, and the tail was bent over top of the cabin. The vertical stabilizer, rudder and elevator were not damaged. The engine was removed from the airframe for further examination. The top spark plugs were removed and a lighted borescope was used to look inside the cylinders. All valves and pistons showed normal wear. Thumb compression was confirmed on all cylinders. Drive train continuity was established through the engine and accessory case by rotating the propeller flange and observing the movement of the gears. Both magnetos were removed and turned by hand. All leads sparked to ground. The four seat, low-wing, tricycle gear airplane, was manufactured in 1959. It was powered by a Lycoming O-540-A1C5, 250-horsepower engine, equipped with a three-bladed McCauley propeller. The last annual inspection was completed on July 12, 2018. At the time of the accident, the airframe total time was 3,435.73 hours which was 13.73 hours since the annual inspection, and the engine had accrued 1,268 hours since major overhaul. The pilot held a private pilot certificate with ratings for airplane single-engine land and instrument airplane. He held a basic medical certificate, issued July 14, 2018. According to the pilot's logbook, he had a total of 704.4 hours of flight experience. He had a total of 15.1 hours in the same make and model as the accident airplane; of which, 12.6 was logged as dual instruction. The accident flight was the pilot's second flight in the airplane without a flight instructor. At 2015, the recorded weather at 28J, was: wind from 180° at 5 knots; visibility 10 statute miles; temperature 27° C; dew point 26° C; altimeter 29.98 inches mercury. 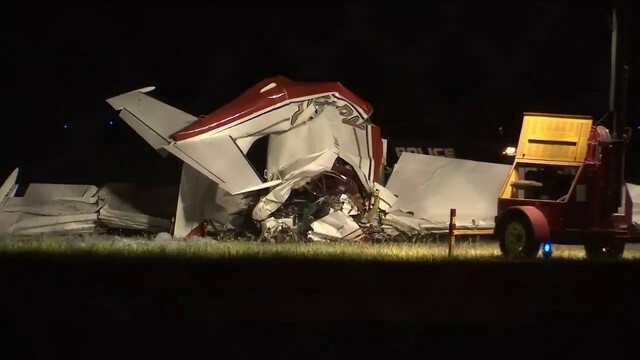 PALATKA, Fla. - A married couple from Alachua County died Thursday night when their small plane crashed in Palatka, according to the Florida Highway Patrol. 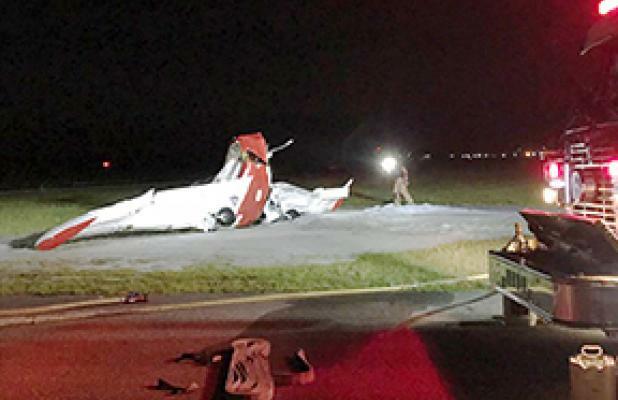 The Piper PA-24 aircraft crashed upon takeoff just before 8:30 p.m. at Palatka-Kay Larkin Airport on Reid Street, near County Road 216. On Friday morning, the FHP identified the victims as David Niblett and Kimberly Niblett, both 44, of Archer. Warren Cilliers, of Cilliers Aviation, witnessed the crash and described the terrifying scene, saying the aircraft tried to do a short takeoff. "The nose came up, but the aircraft did not lift off the ground until a few seconds later," Cilliers said. "It was going super slow, and it was really close to a stall, and I was expecting the nose to come down for them to pick up speed, but it never did as it was climbing up." Cilliers said the angle of the plane's ascent kept getting steeper until the left wing stalled about 100 or 150 feet in the air. "He went into a spiral and crashing to the ground," Cilliers said. "It is something that you never want to see." He said it was very loud as the plane came down but after the impact, "it got very quiet." He said it was immediately clear that no one could have survived the crash, but he called 911 and ran over to the crash to see if "by some miracle somebody survived." But, Cilliers said, no one responded to his calls. "It was very silent," he said. "There was no movement at all." Airport manager John Youell said Palatka emergency responders were on scene immediately, but the couple coudn't be saved. "I’m very proud of the first responders," Youell said. "If there’s a better emergency response team, I’d be amazed." The National Transportation Safety Board arrived Friday to take over the investigation. NTSB spokesman Dan Boggs said weather was not a factor and David Niblett's family said he was an experienced pilot. The airport manager said the couple flew in from Gainesville and were stopping for fuel. Authorities said as part of the investigation, the airport has a hold on the fuel so it can be inspected, which is protocol. Over the next two days, federal investigators will remove the wreckage, then examine all systems: fuel, mechanical, electrical and the wing flaps. Until the wreckage is cleared, one runway will remain closed. The plane was manufactured in 1959 and the NTSB said it was well-maintained. No flight plan was filed. The preliminary crash report is expected to be posted in two weeks. But aviation expert Ed Booth said it could take a year and half to two years before there are definitive answers. "Palatka is a very busy airport with a lot of recreational flying. Recreational flying, of course, isn't as safe as airline travel," Booth said. Booth said the investigators will be busy from the start as they look at many possibilities. "They will look into the pilot's background, how the aircraft was loaded, whether the pilot had any sort of substances in his system," Booth said. 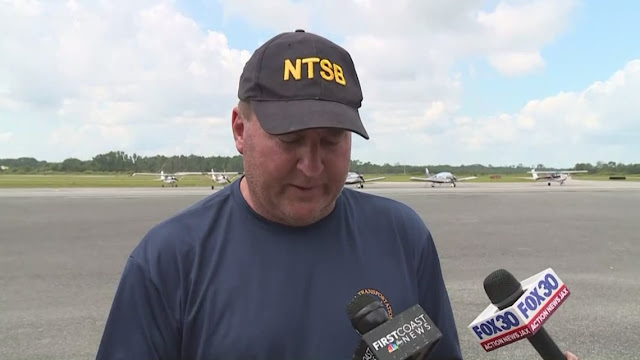 "It's standard protocol that the NTSB goes through in every airplane crash like this." The NTSB said investigators were aware of two other crashes at Kay Larkin Airport. 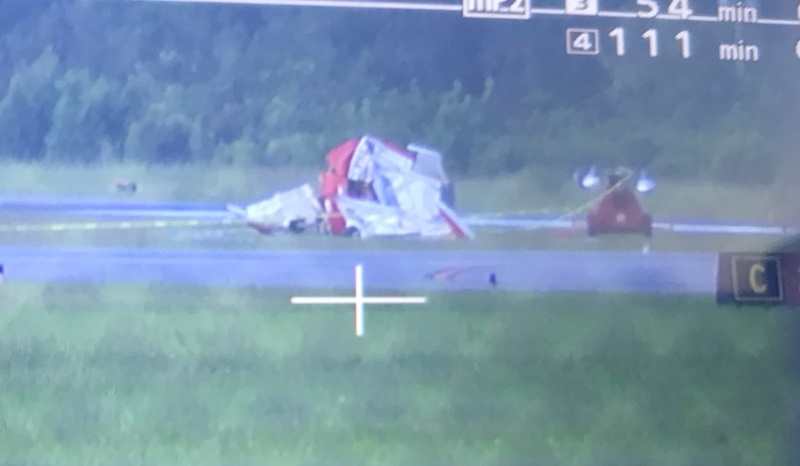 News4Jax covered a March 6 crash when two people were hurt when their seaplane struck a tree, power line and home on Reid Street on approach to the airport. Ten days later, two planes crashed attempting to land at the same time. No one was injured in that incident. "There’s no common thread among the accident," Youell said. "One ran out of gas, two, another plane landed on top of another. And now this one. There’s just no common thread." Kay Larkin is what is known as an uncontrolled airport, meaning there's no control tower. Pilots can land, day or night, without coordinating with anyone on the ground. Yet people who use the airport regularly feel it's safe. "I come here pretty much every weekend," Cindy Gicala said. "I’m one of the skydive instructors at Skydive Palatka. I’m pretty much here all the time." Gicala said that while she’s aware of the other crashes over the last five years, she’s never seen a safety issue at the airport. Federal aviation authorities said they review safety trends at airports regularly, and the history of Palatka's airport would be part of this investigation. 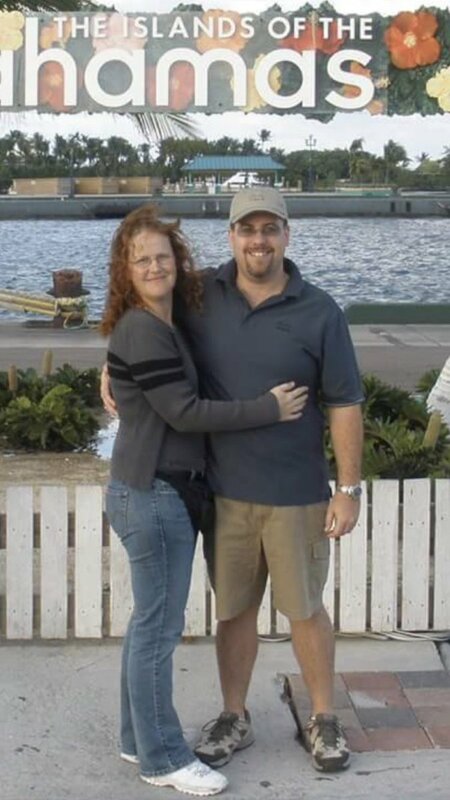 Married couple David and Kimberly Niblett from Alachua County died in a plane crash at a Palatka airport Thursday night. 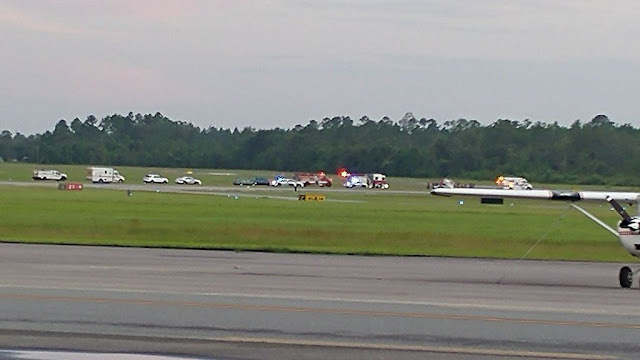 The crash happened at Palatka-Kay Larkin Airport located at 4015 Reid Street. The Florida Highway Patrol said the plane was a single-engine aircraft. The Federal Aviation Administration said the plane was attempting to take off when it crashed in the grass on the left side of Runway 17. According to a FHP report, a man and woman died on scene. Airport authorities told Action News Jax the victims were a married couple in their mid-40s and who flew in from Gainesville. They said the couple stopped for fuel and took off immediately before crashing upon takeoff. There have been four other plane incidents near this airport already this year. A married couple died after a small airplane crashed on the runway at the Palatka Municipal Airport Airport Thursday evening, the Palatka Airport manager confirmed to First Coast News. The couple has been identified as David and Kimberly Niblett, both 44. The manager said they stopped briefly at the airport to get fuel for their plane, then departed after. According to the Florida Highway Patrol, a single-engine aircraft crashed during takeoff and the two were pronounced dead on the scene by Putnam Co. Fire Rescue. On Friday, the NTSB arrived to investigate. The woman's father also arrived at the airport to get more information from investigators, First Coast News was told.